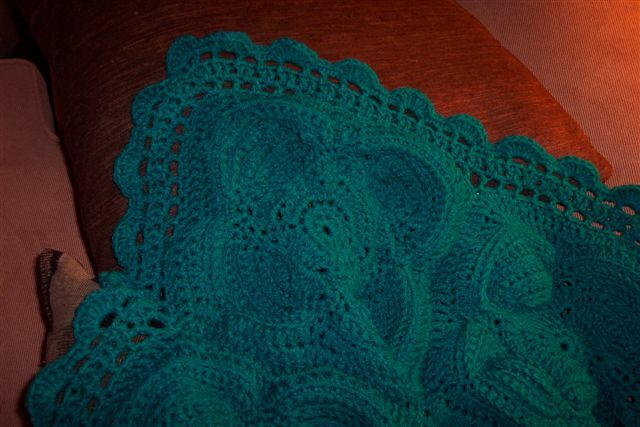 This is the Afghan I came up with, it should help with any meditation. On Vulcan, there are nights that the northen winds bring cool temperatures to the central meridians of the planet. That is where I live and it will be a welcomed and functional accessory and piece of clothing when I do my meditations during the cold months. Below you can see the detail of the stitch, there are some imperfections, but that's on purpose as nothing is perfect in the Universe. Thanks for stopping by my blog and come back again. Hmmm . . do you have a blanket for Rinax? Is that the pleasure planet where the men are wearing skimpy toga things? Great looking afghan . . . I wish my crochet were better. 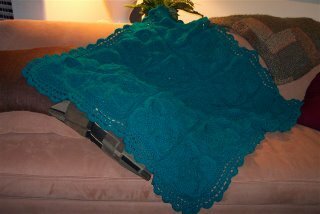 This is, by far, one of the loveliest afghans I've ever seen. Excellent work, Andy, it's spectacular! Just gorgeous! Awesome design and wonderful color!